Tricks, Tips, Walkthrough, Strategy, News, Competitions, Epic Moments and our..
Two of the greatest players in Big Win Sports history managed to join the Immortals Club almost together. Aussie Mavs and Scouser's passed the magical 1,000 trophy line yesterday and are now member #3 and #4. As we know both players as always gentle and sporty not many out there deserve it more. Go celebrate guys! ... started today with 21 teams and lots of TOP20 guns from the All-Time Leaderboard! September review of the number of active teams in the five Big Win Sports brought us a surprising increase of Football team during the past months, almost triple up the past results. Start of the Football season and the link to Facebook did here the job. Good for our Football gamers which took over the top spot ahead of Soccer. All other sports followed the trend downwards with no real new things implemented by Hothead over the past month. With a 4:2 series win over AussieMavs the "Seannies" won our September Basketball week and stopped three time consecutive champion Scouser's to win four in a row. NEXT event organized starts in a week and is for SOCCER. Early November we plan our first FOOTBALL event for a long time. So if you are interested in one or both just apply for participation in putting your information on our Registration board. "Although we have speculated that hidden skill would exist to play a positive role in game results, other than TRJ's suggestions with massive amount of samples, no one really could say it definitely exists or not, maybe because a player with a skill of 100 performs just as well as a player with the skill of 107 most of times." But by measuring how run skill affects player's speed, it would be relatively easier to tell the difference even between 107 and 100, should the hidden skills exist, because all you need to do is to divide a certain distance a player runs, if measurable, by the time he takes to get there. In Soccer and Hockey, it is hard to measure the speed of players because they do not just follow a straight line.. but they go back and forth chasing the ball. In Baseball, though, there is only one path to get to the bases. Players run a straight line to get to a base and turn 90 degrees if they want to go for an extra base. So, what I did here was that I measured the time it ttook for a player to round the bases when they hit a HR. To confirm if hidden skills still matter with a game changer positively affecting them, I used the gold card 'Extra base' which speeds up every player in my team. Player 3* - Speed 100 = 8.38 seconds. There might have been some human errors since I measured each of those times by clicking the stopwatch when players hit the ball and stop it when they round all the bases. But I made sure to minimize all those errors by measuring each case by at least 5 times. So, there it is. Hidden skills do exist, although I would like to measure the difference between run 107 and run 112 but Baseball does not have the chemistry bonus system yet. In MLB, there is the chemistry bonus so skills can go up to 112. I wonder if anyone is willing to try that though? As promised a couple of days ago I like to provide you with my personal golden rules for saving Bucks in Big Win Sports. This is surely an article for less gifted or rich players which try to survive Hothead's customer unfriendly player revenue schemes and straight linked to my last publication "The house wins always" a bit further down this page. What you should do or not do to keep your bankroll in acceptable shape! 1. AVOID FRIENDS / QUICK MATCHES – Just cost your Bucks and you get nothing. Refer to the table below to see how much each match cost you. 2. AVOID EXTRA ENERGY – Play evenly through the day – Each match you play on extra energy cost you 2.50 Bucks you have to earn in addition. 3. FOCUS ON PRO TROPHIES – Do not play too many Amateur Trophies if you are not hunting trophies at all – The cost/revenue ratio for Amateur Trophy Matches is extremely bad! 4. AVOID PLAYING MATCHES AT ALL – Sounds strange but means you should not play matches in trophies which are not getting you to a decent outcome (TOP 3). If you can’t get a top spot, do not invest Gold impact cards or contracts to play on. 5. COMPLETENESS REWARD – Playing for the anyway small completeness reward (5-10 BB) is only good if you get a positive outcome. Means if you have to play 4 extra matches in a pro 20 to get the 10 Bucks for completing all trophy matches remember that the contract cost, for instance in Soccer, will be already 9.2 Bucks to play the matches also if you are not playing any Gold Impact Card. 6. CONTRACTS – In Football and Hockey the usage of 30 (+) standard contract cards is cheaper as buying Big Contracts despite the fact that you have to fountain your players more frequently. Soccer might work too but you have to open much more Bronze Booster packs due to the lower insert ratio of the 30+ standard contracts established by Hothead. 7. GOLD COMBOS – Try to find suitable blue impact card combos or one Gold / two Blue card combos which still provide a decent number of wins. You might not get to the top of the trophy won leaderboards but you operate your team on much lower ongoing costs. 8. REMEMBER the chart below anytime you start a match! Well there are plenty of opinions about the structure which is used by Hothead to run the Big Win Sports Series and one of the hottest topics is often how to survive the terrible and indeed customer hostile payout scheme for winning trophies without investing a lot of real money in buying Big Bucks from the store. The simple answer you can’t if you want to win as much trophies as possible! As we all know Hothead reduced the payout structure for winning trophies constantly downwards in the past, making the last big fail recently in removing big bucks earnings completely from 4th and 5th spots in trophies. The chance to survive with your bankroll and be successful in the game same time is in fact done to zero. To understand what I am talking about I put together some simple charts to show you what I mean. Generally it comes down to how many Bucks you can earn in playing Big Win Sports Apps compared to the Bucks you have to spend to get at least in the top 3 of a trophy collecting some earnings back from Hothead. 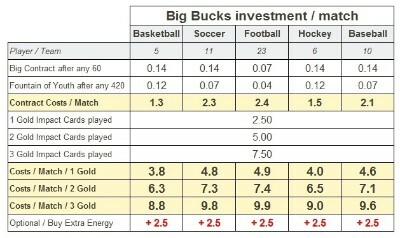 Ignoring additional Bucks you might like to invest in buying better players or skill them up, there are at least three things you have to invest Bucks on a regular basis: Impact Cards, Contracts and Fountain of Youth. Of course it is up to you how many gold impact cards (2.50 Bucks each) you want to play per game and therefore my charts further down showing all levels from just playing three blues up to the most expensive three gold impact cards for each match. It should be mentioned that beside Big Win Hockey the Gold Impact Cards have a strong impact on your match winning percentage. Means if you play more (of course good combos) of them you will win more games and hopefully more trophies and more Bucks. Whatever combination of Blue (Cheap) and Gold (Expensive) impact cards you decide to play the player contract side of things won’t change. If you have found and skilled up good players for your team you have to keep them playing on to avoid ongoing investment in new players. To do so you can use the cheap standard (Green) contracts or the more expensive Big Contracts (Gold). Considering Hotheads insert ratio of 30+ Green Contracts in Bronze Booster you can maintain your team with those in Football and Hockey and with a bit more effort in opening a larger number of booster packs also for Big Win Soccer. It does not really work in Basketball due to the terrible shortage of 30+ contract cards in packs. Anyway, you should not forget that using smaller contracts gets your players much earlier to retirement (after 6 renewals) and you have to pay around twice the times for a fountain of youth to keep them as if you are using Big Contracts (60 matches in average). Comparing now both systems please note that there is no big difference for your ongoing costs in Basketball and Hockey, means you have to pay almost the same for both kind of contract renewal strategies. In Football and Soccer it is still slightly cheaper to use the standard contract cards with some extra fountains considering the large number of players in your teams. Saying this I like to draw your attention on the results of my investigation in the two charts below. 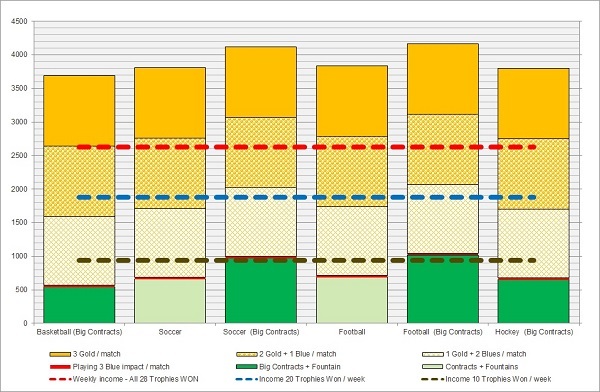 Chart 1 assumes that you are playing all possible games during a week (7 days x 60 = 420 matches, = 4 Trophies each day). It shows you the maximum of Big Bucks you are able to earn if you win all 28, 20 or at least 10 trophies compared to your required Big Bucks investment. The result is quite disillusioning if you see that winning all trophies in a week, which requires for sure to play the best Gold card combos only, will force you to invest in between 1,000 and 2,500 Bucks on top of what you are able to win as prize money. Considering that the most top teams on the leaderboard are able to manage in between 22 to 26 wins at their best, the gap is slightly bigger in reality. To keep your bankroll even the most Hothead Sports require to win around 15 trophies a week just using one Gold Impact Card per match. Good luck on that mission! By the way, as you can see from the chart, Hotheads structure provides Soccer and Football gamers with the worst odds and a more expensive mission, where Basketball the less worse. OK, you might say that the ridiculous low amount of Bucks payout by Hothead for winning an Amateur trophy makes the situation worse. Fair call and therefore I took another look into scenario B, means just playing the weekly PRO trophies and stay away from Amateur events. Chart 2 below assumes that you are playing only PRO tournaments during a week (7 days x 30 = 210 matches, = 2 Trophies each day). It shows you the maximum amount of Big Bucks to earn if you win all 14, 10 or just 5 trophies compared to the required Big Bucks investment. So, you are right, if you win all 14 PRO trophies during a week you end up with a small gain in your wallet also if you are playing three Gold Impact Cards in every match. Easy but you have to think about your own PRO’s in recent weeks. The reality is that this trophies are harder to win as the Amateur’s because of the large number of team playing for the Bucks only. In average a top team just get’s 10-12 trophies a week. Looking at the blue income line for winning 10 trophies we realize that we are now just able to play two Gold’s per match to keep our bankroll leveled, if we play three we have to invest between 300 and 500 Bucks a week ($5/Euro). OK, if you are going for a top position on the leaderboard you will play all trophies and full speed (3 Gold / Match all trophies). In Soccer it means you have to invest 16,600 Big Bucks per months and even more in Football. Grab the maximum prize money of 10,500 Big Bucks and you have still to buy 6,000 BB in the store ($24/month if you buy the cheapest 30,000 BB offer) or in taking a realistic top team approach (prize money ~ 7,500 BB) to pay 9,000 BB a month to Hothead for playing the game ($36/month). Saying this it has to be mentioned that Hothead did not run any store promotions for a long time reducing the 5,000 or 30,000 packages and for good reason. Well success and fun must be paid off but that much? If you not have a proper filled wallet at home you might start looking for some cheaper games out there to have fun. Unfortunately this is already the case as we can see dramatically dropping numbers of regular players every month but Hothead seems to read the situation correctly and try to counteract in appropriate manner in increasing the price for a Big Rush Pack from 10 to 25 Bucks. Good on you guys! However, you cannot change how the apps are merchandised but at least I can try to help you saving some Bucks until the next Hothead axe cut the cake again. Our Hall of Fame has been updated again with some new records provided from the Big Win Community and after the recent software update we included Big Win Football into our Friends Team Code Board. So if you like to publish your friends code over here just send me an e-mail. Big Win Baseball Legends ! Hi guys, I updated recently all Big Legendary Teams Showcases and introduced a new style to list all the team screenshots. There is also an empty part for Big Win BASEBALL to fill and I like to ask you for sending me screenshots of TOP 50 All Time Trophie teams! Hi Guys, just to let you know that I am running an outpost on Facebook to inform more gamers about our community webpage (1200+ Likes to date). If you like to have a look just follow this path. Recommendations on Facebook are highly welcome. Looking for your "Magic Moments"
My dear visitors, having again doubled up our monthly traffic over here in March, I like to enchourage you again to take screenshots and send it over to me. As you already aware off our Epic Screenshot section has massive space left to celebrate records in all Big Win Sports, special epic moments or just funny ones. Therefore I am pleased if you send me your photos to: enthon@bigwinapps.com. 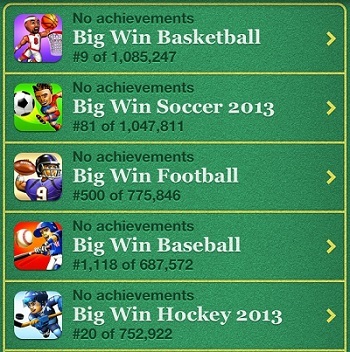 These pages are intended to provide you with inside information around Hothead's Handheld Apps of the BigWin Sports Series.  If you like to contact me just send me an e-mail: enthon@bigwinapps.com or join our Forum!